The lost mobility of a limb is a significant ordeal that requires substantial adjustments in both attitude and lifestyle. A prosthetic leg can grant the ability to walk and perform daily chores but it comes with the price of sudden and often severe pain. This occurs because the brain becomes more and more sensitive as it seeks data about the missing limb. 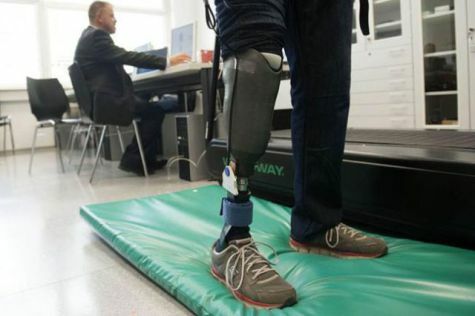 Researcher, Huber Egger, at the University of Linz in northern Austria, has developed a technologially-advanced prosthetic leg that actually feels like a real limb because its feeds the sensation of a real limb to the brain. This not only eradicates the pain, it also grants the patient the ability to actually feel the surface he or she is walking on. Professor Hubert Egger has created the world's very first 'feeling' leg prosthesis, which was unveiled last month by researchers in Vienna. He is a pioneer in the field of prosthetics and in 2010 presented a mind-controlled prosthetic arm, which the user directed with motor neurons previously connected to the lost limb. The principle here is the same with the only difference being that the process works in reverse. In this instance, the prosthetic guides information to the brain instead of the other way around. This very technologically advanced prosthetic leg has been fitted into one of his patients, a 54 year-old former teacher named Wolfgang Rangger, who lost one of his legs in 2007 suffering a blood clot after a cerebral stroke. Over the course of the first six months, the patient indicated a total disappearance of phantom pains, which at one time had greatly disrupted his sleep cycle. He also reported that the artificial leg feels real in every way and that he can decipher the type of surface he is walking on and the kind of pressure being applied. The two men met at a support group for amputees back in 2012. Egger said: "It struck me the he never laughed and he had those dark rings under his eyes. It was awful." How does the new prosthetic limb work? This medical innovation is a two-fold process. First, remaining foot nerve endings were removed from a patient's stump and then placed very close to the surface of the skin into the healthy tissue of the thigh. 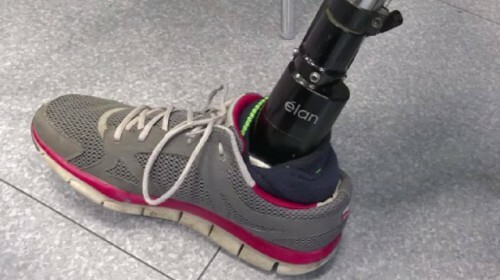 The second step involves the fitting of six sensors into the foot sole of a light-weight prosthesis and then linking them inside the shaft where the stump sits. In Egger's own words: "In a healthy foot, skin receptors send signals to the brain...The sensor (in an artificial limb) tells the brain there is a foot and the wearer has the impression that it rolls off the ground when he or she walks. All things considered, the procedure is a very simple one given results." It is Egger's fervent hope that small companies will join his business enterprise and start building the prosthesis to help bring down the market price, which at the cost of $11,240 is out of reach for most amputees, specifically those in developing countries who need it the most. Hope and an improved quality of life is on the way for amputees whose future looks a lot brghter and pain-free.